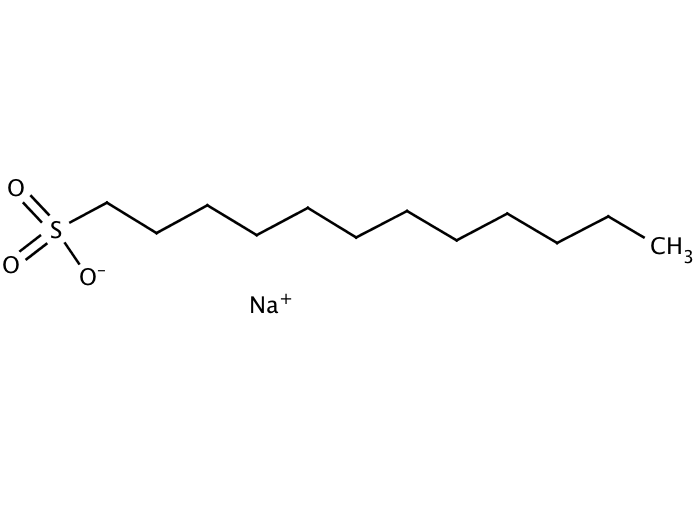 Sodium 1-dodecanesulfonate is used as a ion-associating reagent for HPLC for analysis of peptides and proteins. It acts as an ion-pair reagent, which increases the retention of thiabendazole on HPLC column during the determination of thiabendazole in fruits like citrus and banana. It is used in the synthesis of graphene-nanocomposites. It is also used as surfactant, flotation agent, foaming agent, penetrating agent and emulsifiers. It is involved in the preparation of 1-Chloro-dodecane. Send us your enquiry for 1-Dodecanesulfonic Acid Sodium Salt. We offer custom pack sizes at special prices. We aim to respond to your enquiry within 24 hours. We value your input so if you have suggestions regarding new applications for 1-Dodecanesulfonic Acid Sodium Salt email us and we will include your contribution on the website.